WTH?! (What the Heck?) moments are attempts to find the memorable and the off-beat perspective on Longhorns sports. Here are some interesting moments from the Texas’ game against the Cowboys. Pre-Game (15:00) WTH WHY-O?! Not exactly a uniform statement like Oregon. The Cowboys had the letters WYO on the front of the jerseys. Way to step out on the cool side. While on the subject of uniforms I hate the Longhorns practice jerseys. Never replace the Storm Trooper White uniforms when we go on the road. 1st Quarter (4:02) WTH LHN?! The LHN camera crew had a rough night. The Godzillatron went pink, then fuzzy, then out for a few minutes. The camera crew kept missing highlights of the plays for the video board. The LHN group must have been partying the night before after AT&T U-Verse decided to pony up for the network. 2nd Quarter (15:00) WTH Putters?! It was great to recognize the UT Golf Team for their accomplishment of winning a National Title. Glad we can beat Alabama at something. 2nd Quarter (9:40) WTH Vaccaro?! Kenny Vaccaro was all over the place, and he picked off his first of many footballs this season when he jumped the route to get the momentum back for the Horns. 2nd Quarter (4:48) WTH Statue?! The play that keeps OU fans up at night. Nice execution by David Ash to Malcolm Brown. It was great to see Joe Bergeron and Malcolm Brown each post 100 yard games. 2nd Quarter (3:44) WTH Tightrope?! It was nice to see the Wild Formation which Bergeron gave the ball to a streaking DJ Monroe for a touchdown. Are we going to call it the Wild Joe? 4th Quarter (4:28) WTH Jordan?! We are going to have a lot of sleepless nights if the field goal kicking does not get better. Nick Rose can definitely handle the kickoff duties, but so far Nick Jordan leaves something to be desired when trying to split the up rights. Misses of 46 and 44 plus a botched extra point is not the legacy of kicking on the 40 acres. Football player or track star? How about both? In his first collegiate meet, Goodwin notched two provisional qualifying times and two titles at the Arkansas Dual meet. The freshman clocked a 6.69 in the 60-meters and posted a mark of 7.72 meters (25-4 ft.) in the long jump. Both marks currently rank third in the nation. 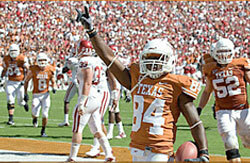 Goodwin, who snagged 3 passes for 70 yards in the title game versus [tag]Alabama[/tag], is expected to be one of the Longhorns’ top wide receivers for the 2010 season.